David Good ’11, an ESU graduate biology student, is one-fourth Italian and one-fourth German. The other half of his familial blood flows from the Amazon Rainforest, directly through his mother, a full-blooded member of the Yanomami tribe. It was with his Amazon family that David discovered confirmation of his dream to bridge two worlds. Good’s father, Dr. Kenneth Good, an anthropologist, had lived among the Yanomami for 12 years. Somewhere in that time he fell in love with a young Yanomami woman and married her according to tribal customs; marriage vows they repeated later in the United States. Eventually, Dr. Good asked his wife, Yarima, to return to New Jersey and live with him “in his village.” Yarima, perhaps a bit nervously, since she had never ventured much farther than the next village, accepted. Dr. and Mrs. Good did not make the plane flight alone, however, for Yarima was pregnant, and just a few months shy of giving birth to David. Family life was happy though; Dr. Good was teaching, and eventually the couple added two more children to their small tribe. David spent his childhood, at least it’s first five years, with feet in two cultures, playing stick-ball with his American friends one month and toting his bow and arrow through the jungle to hunt lizards with his Yanomami cousins the next. The family made four or five lengthy visits to Yarima’s village; but eventually homesickness became too much and David’s mother made the heartrending decision to return to the jungle, alone, to stay. Fast forward 19 years to July, 2011. David is now an ESU grad, with his bachelor’s degree in biology. He is also a young man who, though for a long time struggled with what he saw as “abandonment,” has come to terms with his mother’s need to return to life in the jungle and her vastly different culture; one she had known for nearly 45 years. In the three months he spent with his relatives, David never felt treated as an outsider, or “nabuh,” in the Yanomami language. “I was one of them,” he says. “I felt a deep connection with my people.” Perhaps that feeling of belonging reinforced David Good’s decision to continue on for his master’s degree in biology, for which he is already in his first year at ESU’s graduate school. His goal is to return to the Rainforest to live and work among his people. Heard about you on NPR radio in Chicago, on July 21st Sunday afternoon radio program. Was so MOVING and heartfelt, but could not remember the organization you are starting to help your MOM]s tribe like JUMp somthing. Can you send me the link or information. Great GOING. Keep it up. As a mom, I so am moved by your love for your mom, and her, you. David, I was a good friend of your father at Penn State and his roommate for a year. I have heard about you, but have never seen you. I just read this article and was so pleased to see you met your mother. I think your goals to be “a bridge” to modern society by living in two worlds will lead to astounding and challenging opportunities. Best of luck to you and I would like to visit with your Dad someday. David’s family’s story has brought me to tears. A woman who leaves home for love, then isolated in another culture. Her husband who becomes part of a Yanomami community, but is constrained by economic and legal realities. Three children, separated from their mother at a young age. For reasons they are too young to comprehend, and shouldn’t have to. I think of these kids who have to try to navigate one of their two worlds. I’ll bet it has been hard at times. I’ll bet they are all very interesting people. One thought. We define ourselves, our identities, as “over-and-against” other people. To say that “I’m an American” is to say I am part of a group which, axiomatically, excludes others. And in so excluding, it makes it easier to judge perceived outsiders, to ignore the effects of our actions upon them. To treat them as less than us. Less than human. I think of David. Half Yanomami. Half Italian-German American. What is he? He’s human. Like all of us. When we look at David, we should think about our shared humanity. We are all brothers and sisters. I was in tears when I watch the video where he is meeting his mother after 19 years. I want to follow this. I hope there will be updates and more articles on this very interesting story. David, if you read this, I’d love to speak with you. I’m writing a novel that surprisingly closely resembles your story and obvious struggle. I am surprised because I am on the final chapters of the writing and had never heard your story until today. I have done a good amount of research on the Yanomami and watched numerous documentaries, but just came across yours today. I’d love to chat with you about your journey and possibly share a bit about the fictional story of my character. 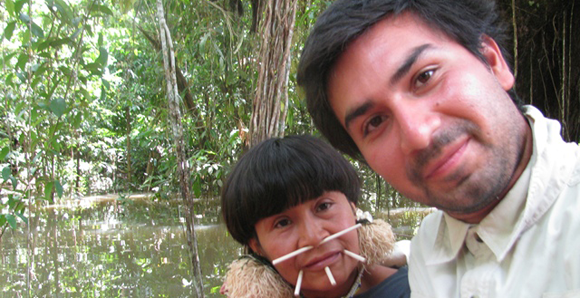 Best to you and your Yanomami family, and in your goals to bridge two worlds. Interesting enough, in my story, the half-Yanomami, half-American young man does much the same thing.